Heather and Dennis Faulkner are a team at work and in life! They utilize each of their strengths to make an unstoppable Real Estate team! Always growing and learning, they will help you buy and sell with confidence! Welcome to Country Club Estates. 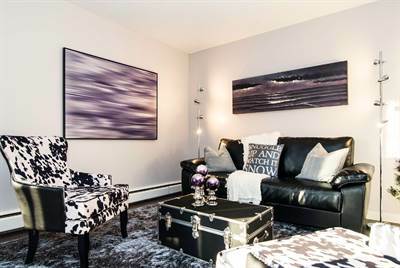 This bright and welcoming 3 bedroom corner unit is perfect for investors or first time home buyers. 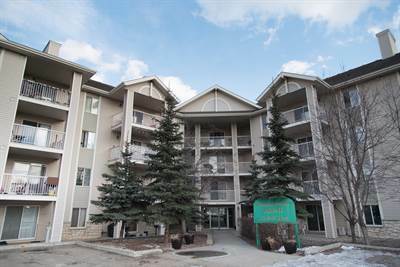 Located in desirable Patricia Heights, the complex is connected to off leash areas and river valley trails. Easy bus access to the U of A, downtown and West Ed. The main floor of the unit consists of a large living area, updated kitchen, dining area, and access to the balcony. Upstairs you have 3 generous bedrooms and bathroom. The complex is just ending the overhaul of the sewer/parking lot and will be moving forward with beautification next. You must see this unit to appreciate it. Condo fees include Heat, water, sewer, etc. Pet friendly with registration and board approval. Condo Fees – how are they calculated? If you are thinking of buying a condominium in Alberta, understanding condo fees is key to making good decisions. When you write an offer “pending the review of condo documents”, you will receive hundreds of pages of information. Knowing what makes up the condo fees will help you determine if the condo you are considering is a good buy or not. Every month condo owners pay a fee to the condo corporation to cover their share of the “COMMON EXPENSES”, also known as shared expenses. COMMON EXPENSES are expenses for the operation of the condominium complex and include things like maintenance, snow removal, parking lot paving, lawn care, property management, accounting, insurance for the building(s), administrative expenses, maintenance, utility costs, and RESERVE FUND CONTRIBUTION. Every 5 years the Condo Board has to order a new RESERVE FUND STUDY. This study is a major inspection of the entire common property. It outlines the life expectancy of the components and comes with RESERVE FUND PLAN recommendations. This tells the condo corporation how much money needs to be in the Reserve Fund bank account to meet the replace/repairs needs identified in the reserve fund study. Every year the elected board must create a budget to cover the COMMON EXPENSES and to save an adequate amount based on the RESERVE FUND PLAN. Each condo has a total unit factor of 10,000. Each unit is assigned a unit factor which is typically based on the physical size of the unit. 143/10000 x $465,000 / 12 months = $554.13 each month. Condo owners should expect a prudent condo board to increase condo fees on a regular basis. The costs of fuel, new carbon taxes, increases in electricity rates, increases in minimum wage, unexpected repairs, frivolous lawsuits, etc. will all have an impact on the condo fees and some can not be fully anticipated and saved up for. It would be wise to mentally budget for a 3.5% increase per year just to keep up with inflation. As well, you should anticipate more when increases such as the new Carbon Levy come into fruition. Here are a few red flags you can find during your condo document review. These could point to a future increase in condo fees. Underfunded reserve fund. If the actual amount of money in the reserve fund is far less than the reserve fund plan states should be there, you may have a problem. Investigate this further. Super low condo fees. Yes, this is a red flag. It could be a sign that there is not enough money in the reserve fund to cover future costs. If it seems too good to be true, it probably is. Check it out. Under funded budget. If the expenses are way higher than the budget don’t let it go. Ask questions. Sometimes this means an annual budget item is paid in one lump sum sometimes it means there is a cash flow problem. Ask questions. Unexpected repairs: Reserve fund studies can not anticipate everything. A water main break, sewer line collapsing, roof leaks are common unexpected repairs that can result in either increases in condo fees or special assessments. Read the meeting minutes for signs of impending major unexpected repairs. Lack of capital repairs or replacements. Even if the condo is on track with the reserve fund contributions, but has not made the repairs you need to ask why. A well run condo will do the repairs and replacements to maintain your investment. Help ensure the condo you buy is run properly by volunteering for the board of directors. Every 12-15 months your condo corporation will hold an AGM, or Annual General Meeting. Volunteer yourself to be on the board. Interestingly, most boards don’t get enough volunteers. Your willingness to serve your community will be welcome! Being on the board of directors will give you valuable insight to the day to day operations of the corporation. Additionally, you will be a deciding voice for the financial decisions that will impact you and all the other owners in the complex. For more information on how condo fees work or anything else condo, email: faulknergroup@shaw.ca! Format AsidePosted on March 7, 2017 Categories CondosTags Condo documents, Condo Fees, Edmonton Real Estate, YEGRELeave a comment on Condo Fees – how are they calculated? 41, 52210 RR 192 in El Greko Estates, Rural Beaver County is Sold! 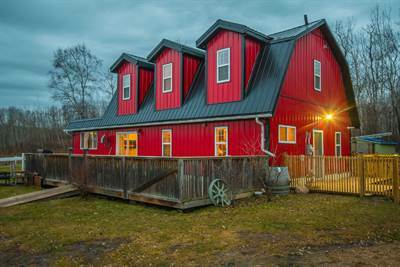 Posted on February 23, 2017 Categories UncategorizedLeave a comment on 41, 52210 RR 192 in El Greko Estates, Rural Beaver County is Sold! 424 8604 Gateway Boulevard NW in Strathcona, Edmonton is Sold! Posted on February 16, 2017 Categories UncategorizedLeave a comment on 424 8604 Gateway Boulevard NW in Strathcona, Edmonton is Sold! 4047 29 Street in Larkspur, Edmonton is Sold! Posted on February 16, 2017 Categories UncategorizedLeave a comment on 4047 29 Street in Larkspur, Edmonton is Sold! Includes 1 year pre-paid condo fees!! Penthouse Townhouse? What is that? Yes, you read it right. A penthouse townhouse. This is a very unique property. It’s not your cookie cutter home if that’s what you were looking for. 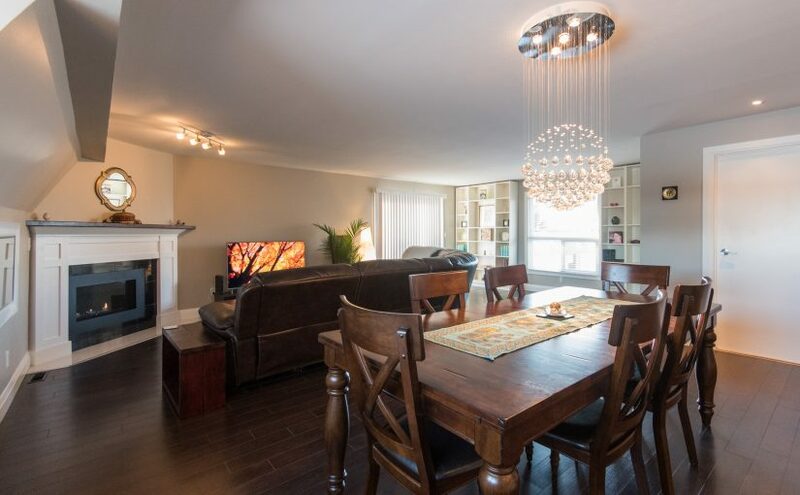 This property is gorgeous open concept home nestled on top of two townhouses. That means the whole top floor belongs to this one home. It allows for a very unique use of space with a great view from every side. This home features over 1550 sq feet above grade — that means above ground. The basement, or below grade, is fully finished with an office (including built-in work stations), workout space (or whatever you can dream of space) and lots of additional storage. The staircase is even private and the landings contain great drop zones — places to put your purse, keys, jackets, etc. and keep that clutter from invading the rest of the property. This penthouse townhouse is located in Greenview. 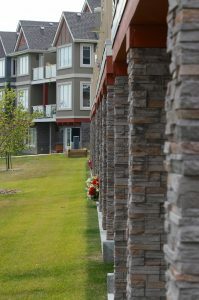 Greenview is the neighbourhood that backs onto the Mill Woods golf course. The condo complex, called Greenview Terrace, backs onto Greenview park. From here you can walk out your door and go walking, skating, sledding or go to the playground. Additionally, transit is nearby and so is shopping for your convenience. Getting around the city is easy to do being so close to the Whitemud freeway. 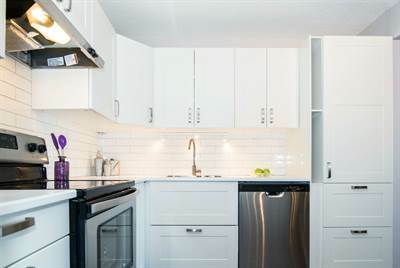 Fully renovated and move-in ready! Modern and durable laminate wood flooring has been installed throughout the main living area. Ceramic tile has been installed in the kitchen, and in the bathroom, a warm vinyl tile. The original kitchen was replaced with white wood cabinets. These cabinets have soft close hinges and drawers. The tile backsplash is another fresh update and the kitchen is finished off with gleaming quartz counter tops. 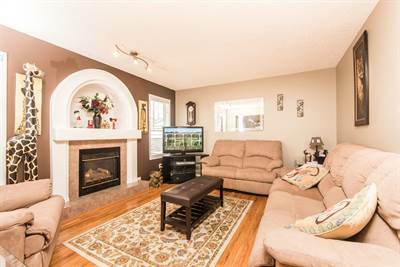 Additional renovations include a gorgeous wood mantled gas fireplace, light fixtures, high efficiency furnace and so much more. You can find additional details to this unique home on www.greenviewpenthouse.com. 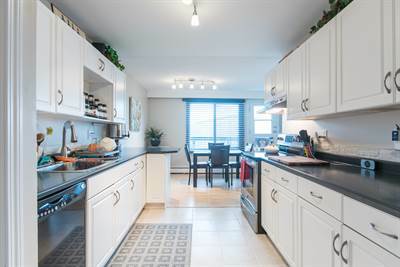 Posted on January 6, 2017 Categories CondosTags condo, edmonton, Edmonton Real Estate, penthouse townhouse, YEGRELeave a comment on Penthouse Townhouse? What is that?